Confluence is designed to be the perfect environment for your team's documents, images, and ideas, so that everyone can stay on top of the team's work. And dozens of apps exist for Confluence to help you create rich content quickly. As a Confluence user, you probably know how essential it is to have all the tools you need always at hand to get your work done. If you avoided adding images to Confluence in the past, because it was too much hassle to manually configure and format your page, you'll be happy to know there are now tools that will make it smoother, easier, and faster. Plus, you won't have to switch between contexts and tools so often! It would be great if Sketch could add more geometric shapes to its tool panel. The ability to blur sensitive data would also be useful. Plus, being able to rotate images would really improve Sketch's usability. It's easy to get started with Sketch. It requires almost no effort. You just need to click the Sketch button on your image in your page in edit mode, and start annotating. Develop an app for Confluence Cloud. Update the product more frequently, as the most recent version was released in 2014. 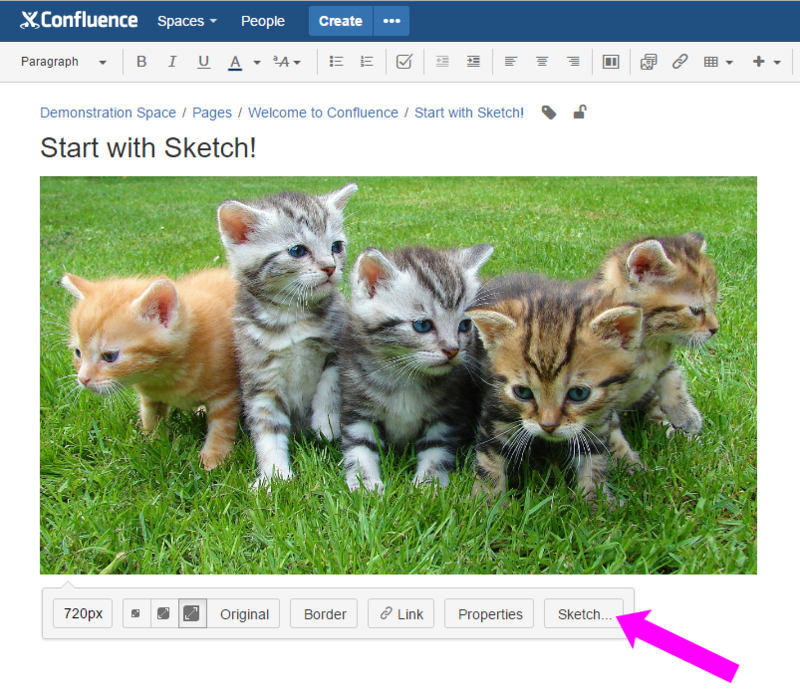 StepShot Image Editor for Confluence introduces a new way to edit images in Confluence. It is a real time-saver that lets you complete tasks like adding text to an image quickly and easily. By using StepShot Image Editor, you don't need to worry about saving copies of the same image, as all of the changes you make will be saved on separate layers. 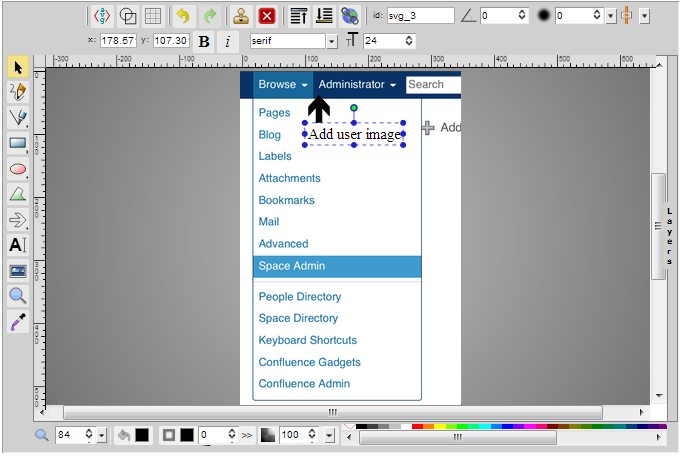 Plus, StepShot Image Editor is designed for both Confluence Cloud and Confluence Server. Add a shadow effect to images. Your corporate image should be consistent, both internally and externally, and a unified knowledge base is the key to success. Confluence is the best place for storing your company's knowledge. But you also need to have a solution to capture that knowledge in the best way possible. This is where StepShot Guides for Confluence steps in. Because it is integrated with the StepShot Image Editor for Confluence, it makes process documentation easy to create and use both by employees and customers. StepShot Guides for Confluence is designed to help you create training manuals, how-to guides, software walkthroughs, and online help within Confluence using sequences of screenshots taken with each mouse click. 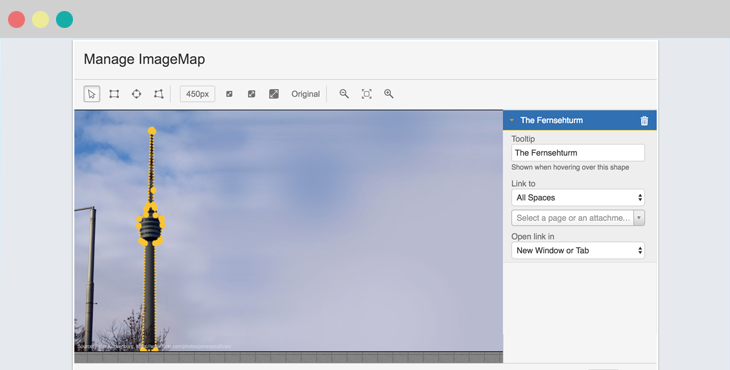 Scroll ImageMap for Confluence is a lightweight app for both Confluence and Jira, developed by K15t. Scroll ImageMap for Confluence makes static Confluence images interactive by allowing you to add multiple clickable areas within them. Image Slider for Confluence lets you display content in Confluence attractively. It provides three macros that are fully mobile compatible and responsive, that let you 'slide' through page content like text, links or even charts easily. Image Slider for Confluence was nominated as one of the best paid apps in the Marketplace at Codegeist 2012, and is now one of the top apps on the Atlassian Marketplace, with more than 600 active installations. Available for Confluence Server only. If images have different sizes, the image slider will use the size of the smallest image for all images. What's your favorite image editing app for Confluence? All of these options have a crystal-clear pricing plan which customers definitely appreciate. You should renew your maintenance period each year. Although you will still be able to use your app if your maintenance period expires, you won't be able to receive updates or support. If your documentation in Confluence has lacked images because you didn't want to invest the extra time in using external tools, you can now do something about it. Use one (or more) of the apps mentioned above to work with, annotate and use images, easily, right within Confluence - no context switching is needed. All of these apps have help to get you started, and once you give them a try, you will be thrilled with the results.